Death is never neat and tidy even in our modern world. Children seem to have an innate sense of this fact. I spent many years teaching young children—I love stories and storytelling—so when my students told stories to each other I paid close attention. The ghost stories I heard being passed around on the playground and in the classroom have nothing to do with the ghost stories that are told by adults in books, in films or on television. What struck me as most fascinating is the way these tales were told had a greater impact on these children than the stories themselves. Young children tell ghost stories to delight in terror but they very carefully control—“control” being the key word here---how much terror is allowed in these stories. Within children’s oral traditions they do not need adult censure—they are very conscious of how much of a fright they can handle. This knowledge empowers them to a much greater degree then most adults would suspect. One trick children use in telling these stories is they never address directly the monster, ghost or whatever the cause of their fear is. In fact in many of their stories this source of fear is never even mentioned. Another major devise they use is humor—this humor is placed strategically at the end of their stories and allows them to address their fears with a built in safety valve or release. But foremost in their minds is to entertain and be entertained. Young children adore surprise or startling endings so at the end of these stories they always break out in peals of laughter. 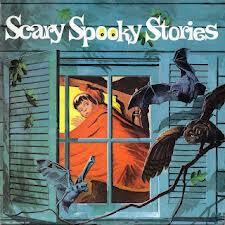 Several of the children’s ghost stories I have shared in the past use these tricks. “Bloody Fingers” with its surprise humorous ending. “The Golden Arm” with its gotcha moment at the end. Mark Twains’ ghost story with him loudly stomping which startles the audience into laughter at the end and the various “jump stories” I have shared all reflect how young children tell ghost stories. Young children keep the ghost stories they tell simple but when adults consider them more carefully it becomes apparent that children’s ghost stories just like adult ghost stories impart in-depth lessons. So children are not only addressing their fears in a safe manner they, just like adults when they tell ghost stories, are passing on societal norms to their peer group. A classic example of this is a children’s ghost story that originated in Poland entitled “The Stolen Liver”. 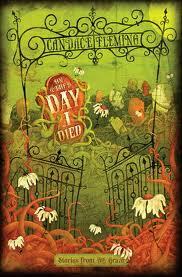 A more modern version of this tale that I heard my own students tell is a simplified version of this original tale. There are just two main characters in the story, the mother and a son. This story teaches norms about listening to your parents and I imagine it’s original intent was to teach children to avoid cannibalism and grave robbing. It of course has a surprise ending for my students told it as a “Jump Story”. A mother sent her son to the store to buy liver. Now go there and come right back. I am making your father’s friend a special meal tonight. His favorite is liver so ask the butcher for the best he has. Forgetting his errand he played several innings with his friends. As the sun went down he realized what he had forgotten, he quickly jumped on his bike and headed to the store. But when he got there it had already closed. He reluctantly headed home. His mother was going to be mad. As he passed the neighborhood cemetery he had an idea. He went to the fresh grave of his Uncle Henry. He doesn’t need his liver anymore. He found a shovel in the cemeteries shed and started digging. He then quickly headed home. His mother cooked the liver and his father and his friend enjoyed the meal. Tommy relieved went upstairs to bed. He fell asleep quickly. Later, a booming voice woke him up. Tommy lay still as he heard loud footsteps come up the stairs. The footsteps stopped outside his door. The door slammed open and he saw his uncle’s face floating above his bed. At this point the child telling the story would always lunge at or grab another child nearby. The group listening would then always laugh, giggle or shout out in loud delight—showing their approval. 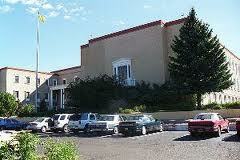 The PERA (Public Employees Retirement Administration) building in Santa Fe, New Mexico was constructed in 1966. With the PERA building construction, the school’s buildings were torn down but the old potter's field cemetery presented a problem that some considered at best to be just a nuisance. The PERA Building has five floors. Two of these floors were built underground. So the building has a basement and sub-basement. At the time of construction it is said because of financial and time constraints some bodies were removed to make way for the basements but others where left. People flatly refuse to spend time in the PERA building's basements after dark. Unseen hands are said to reach out and trip people as they walk down the staircases that lead to the basements. Loud cries and moans are also heard in this area. Another ghost of a woman dressed all in black has been witnessed on the property for many years. Old-timers in the area believe that this land was actually haunted before the PERA building was constructed. In the 1800s wealthy families from all over the Southwest and Mexico sent their sons to be educated at St. Michaels. It is stated that a tragedy struck two of these students in 1867 when they drank tainted water and died. Some accounts of their deaths mention they contracted cholera and died others state they actually died of smallpox. In both versions of this legend, it is mentioned these boys were buried quickly in the old pauper’s graveyard in unmarked graves. This was done at the request of the city authorities in order to prevent panic from spreading among the citizens of Santa Fe. The mother of one of these boys, Dona Maria Sanchez, heard the news and traveled to the city. When she arrived she was disturbed to find that the authorities would not let her take her son’s remains home. They would not even tell her where he was buried in the cemetery. Mrs. Sanchez heart-broken with grief remained in Santa Fe. 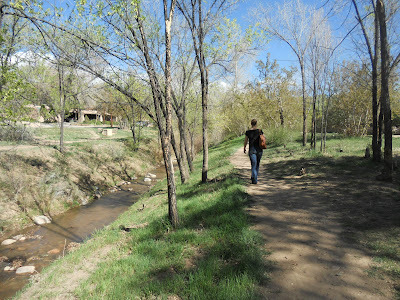 For years she was seen every day walking to the adobe-walled cemetery with her rosary in her hand. Unfortunately, it appears Dona Maria cannot rest in peace. Some state she is still looking for her son. Her ghost, a short woman dressed all in black clutching her mantilla tightly to her face, is seen walking in the corridors of the PERA building. She is often seen walking through walls. But most witnesses, employees at PERA state they see her walking quickly through the parking lot toward the area where the graves remain underneath. She appears so real many of these witnesses have spoken to her but she never acknowledges their greetings. 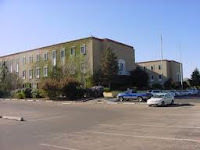 * St. Michael’s High School or, as it was first known, El Colegio de San Miguel, was conceived by Jean-Baptiste Lamy, the first bishop of Santa Fe, he brought four Christian Brothers from France to run the school in 1859. The first buildings were adobe and had dirt floors. 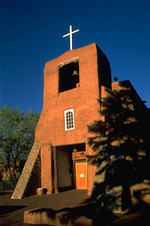 One original building connected to the school is the San Miguel Chapel—the oldest church in Santa Fe— it still stands at Old Santa Fe Trail and De Vargas Street. ** Written records were not kept for this cemetery so it is not clear when it was first and last used. *** I must mention here I dislike what was done. To disturb these bodies is bad enough but since it was done--all the bodies should have been removed with respect and given proper burials somewhere else. **** It is stated that another famous ghost in New Mexico La Llorona--The Weeping Woman-- also haunts this area for the Santa Fe River runs by the building. ***** As recent as 2010 a Santa Fe utility crew digging near the PERA building unearthed some of these unsettled bones. 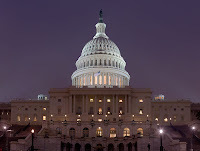 This building located in Washington D.C. holds the U. S. Senate and House of Representatives. It was first built in 1800 and ever since several non-famous and famous ghosts haunt it. In another post entitled Harbinger Spirits I wrote about the Demon Cat who scares people in the basement of this building, a variety of other activity that has been observed occurs in and around this same area. 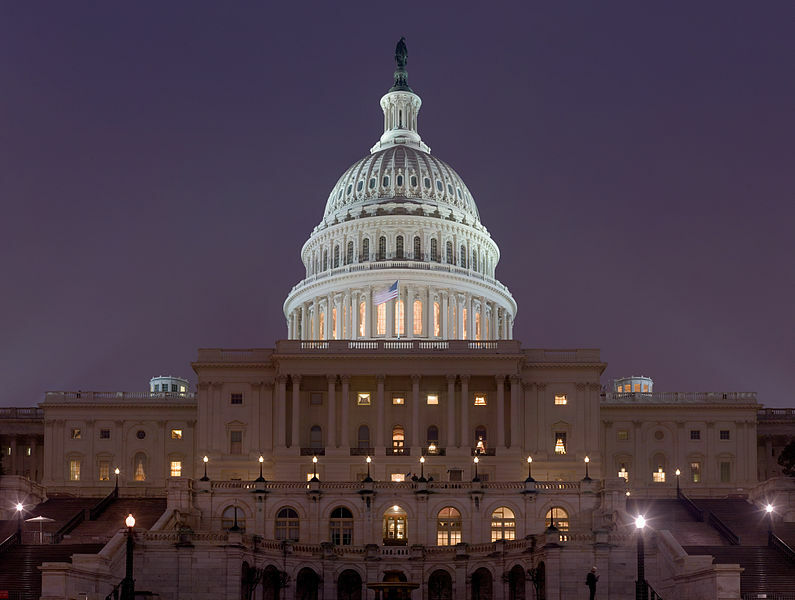 Many of the witnesses to this strange activity are Capitol guards who patrol this massive building’s rooms and corridors on the nightshift. These guards report that late at night as they cross Statuary Hall they hear footsteps following closely behind them. This disturbed one guard so much he decided to investigate further. For several nights in a row he wore soft -soled boots that he knew would not make noise but he still heard the footsteps follow him. Ruling out the possibility that what he heard was his own steps echoing he then tried to pinpoint the footsteps he did hear. At one point he felt he had cornered them but then to his surprise he heard them in another part of the hall. 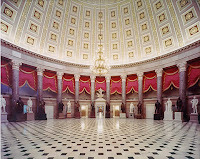 Life size statues of famous statesmen from American history line Statuary Hall; originally this area was the chamber for the House of Representatives. A brass tablet set in stone marks the spot where the sixth president of the United States, John Quincy Adams desk was located. Yet another phenomenon that has been witnessed in Statuary Hall is not true for the guard that reported it was fired later for drinking on the job. I place it here because it is amusing and it is a well-known legend that has been past down for many years. 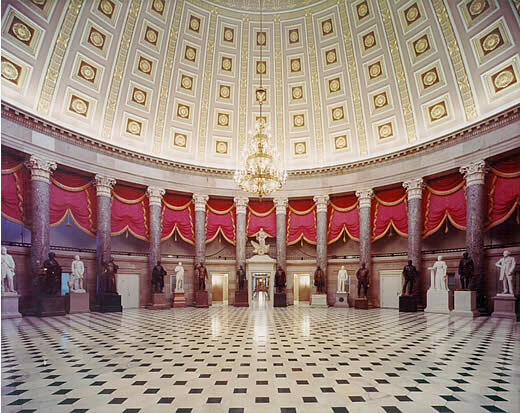 This guard stated that at midnight he would see the statues in Statuary Hall leave their pedestals and float around. He said that they seemed to enjoy doing this particularly on New Year’s Eve. 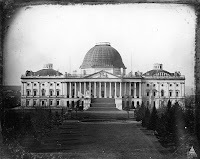 One ghost that is seen often roaming the Capitol corridors is that of a French engineer and architect, Charles L’Enfant who was commissioned by President George Washington to design the then Washington City. L’Enfant bucked heads often with Congress over his plans. Not willing to compromise he was eventually fired. Sadly, in 1825 he died a pauper his work mostly unpaid for and under appreciated. Ironically, in 1889 Congress changed their minds. They took his work from the archives and used them. Witnesses that have seen L’Enfant’s ghost state he appears depressed. He is described as small in statue and is seen carrying a roll of parchment under one arm. He is observed in the Capitol's basement pacing the floor and shaking his head. Another well-known ghost is that of President Ulysses S. Grant’s vice president Henry Wilson. 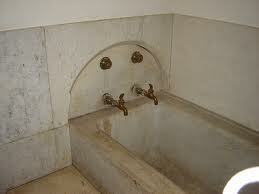 Spas or baths were imported from Italy and installed in the Capitol’s basement for the congressmen to use. It is said that Wilson was overly fond of these tubs. In November of 1875 Wilson caught a respiratory infection after bathing. His ghost is heard coughing and sneezing in the corridor that heads to the vice president’s office. He is also seen returning from the basement spa wrapped in towels. One guard reported that one night as he guarded the coffin of a Tennessee Senator that was laying in state that he was shocked to see Vice President Wilson approach him and then just vanish. Yet another ghost that vanishes is a man that several guards have seen late at night beneath the hall of the House of Representatives. This figure stands erect, has a large mustache and always has his hands clasped behind its back. Guards have even approached this figure thinking he was an intruder only to see him quickly fade away. Another ghost that is seen is of a man who while working on top of a scaffolding in 1860 fell off and was killed. He is seen walking the corridor near where he died. In 1881 President James Garfield was shot and killed. His assassin, Charles Guiteau is seen on a stairway leading to the basement. One more late night ghost that is observed on a regular basis at 12:30 P. M. is General Logan. The guards recognize his long hair, military stance, and the hat he always wore while alive. He is seen silently opening the door to the room that once housed the Committee on Military and Militia on the senate side of the building. On the marble stairs that lead to the House Gallery there is a stain that will not come out—even though it has been cleaned countless times. This stain is the blood of William Taulbee, a former congressman from Kentucky who in 1890 got in a fight with a newspaper reporter, Charles Kincaid. It is said the two argued over some negative articles that Kincaid had published about Taulbee. Kincaid pulled out a gun and shot and killed Taulbee. Legend states that whenever a reporter trips on these stairs it is the ghost of William Taulbee taking revenge. * John Quincy Adams is unique in that he served eight terms in the U.S. House of Representatives after he was president. The myths surrounding Screaming Skulls are almost always connected to stately homes in England. These skulls, which are believed to contain a spirit, are still kept within these homes because it is believed that if they are removed it will result in a relentless haunting. Over the years not many investigations have been done because most of the homes that own these skulls are privately owned and are not open to the public. So separation of truth from myth has not been established but nonetheless these haunted skulls and the folklore that surrounds them is intriguing. Most Screaming Skull stories have several elements in common. It is often stated that these skulls were discovered somewhere hidden in these homes and that they are the remains of a person who directly wished to be buried there. But it is these last wishes that cause the hauntings—for if these skulls are removed from the home and given a proper burial chaos ensues. This chaos includes strange noises, hauntings and even poltergeist activity if this deceased person’s last wishes are ignored. Early on, the people who encountered this activity tried to rid themselves of these skulls in a variety of ways. Some threw these skulls into lakes and rivers others tried to grind them up to get rid of them, others tried to burn them but it is stated that these skulls would reappear regardless of the method of destruction that was attempted. Once these skulls were removed-- terrifying screams were heard along with other unnatural loud grunts and groans until finally these skulls were physically retrieved and placed back within the house. Because of this many of these skulls are kept in a prominent place in these homes—at the top of the stairs, on a ceiling beam or on a centrally located table. Some are even kept in glass cases. All in an attempt to show these spirits that their last wishes have been respected. These stories often recount that these homes experienced bad luck when these skulls were removed. It is stated that terrible storms occurred, crops failed, livestock died or even family members died as a result of these skulls being removed. In contrast it is believed that if these skulls are left alone they actually bring good luck to the home and the family that resides within. Hence the prominent position they are given in most of these homes so they can rest in peace. Screaming Skull stories are all relatively recent in English history. Most date from the middle of the 16th century. One famous story surrounds the Bettiscombe Manor located in the village of Bettiscombe in Dorset, England. This story involves a man, Azaniah Pinney whose involvement in the English Civil War, he supported the Duke of Monmouth, caused his banishment to the West Indies in 1685. While in the West Indies he became a successful businessman so when he returned to Bettiscombe Manor in England he was a wealthy man. He brought back with him an African slave. This slaves’ existence was one of misery and the legend states he died as a result of foul play. It is not known if he murdered someone or someone murdered him. As this slave lay dying he announced that his spirit would not rest in peace until his body was taken back to his homeland. Pinney, contrary to his slave’s last wish had his body buried in a local churchyard. Soon after his spirit started to haunt in protest. Screams were heard coming from the grave and strange noises were heard within the house. 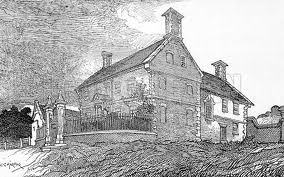 This continued until Pinney was forced to have the corpse dug up at which point it is said that he stored the body within the manor's attic. When several more attempts were made to rebury the body the screaming would always start up again. At some point during this process the body was lost and only the skull remained. The skull was then thrown into a nearby pond but the noises became so unbearable the skull was retrieved and it has been at Bettiscombe Manor ever since. This story has been debunked in more recent times. It was discovered that this skull probably is that of a female and is much older than what was originally thought. Despite this the Bettiscombe Skull is still kept for good luck. It is kept in a box in a bureau drawer. In future posts I will share other Screaming Skull stories.